The Farmers Cay Regatta is over so we got up this morning and decided to use the calm winds forecast for today to move the 48 nm to Georgetown. Leaving at 7AM we were among the first boats leaving, but after 20 minutes we looked back and there were 10 boats behind us. 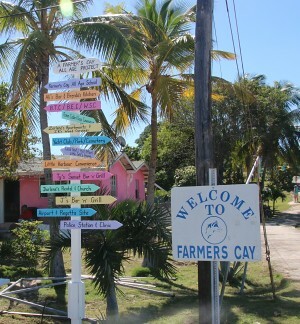 Georgetown is a logical next stop after Little Farmers Cay and since there were over 100 boats at Farmers we shouldn’t have been surprised at the crowd. 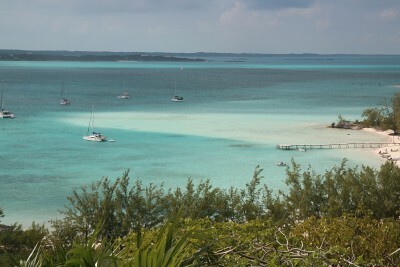 By the time we were through the Cave Cay Cut into the Exuma Sound there were 30 boats within eyesight. Other than pouring rain for an hour it was a pleasant trip with time to charge the batteries fully and make enough water to fill the tanks. We are anchored off Sand Dollar beach and although there are lots of boats there is plenty of space. Glad you are enjoying the skiing. Front going thru today, but so far it’s a non event except for a couple of squalls last night with lightning and winds just to 27. I’m so glad your trip is going well. I miss you all. The ski vacation is going well and the skiing has been great. Lots of snow, but the weather is a little cold at 10-15. I am sitting hear as the sky is dumping 15-24″ of snow. It is a “white out”. The kids drove up from NY last night because of the predicted weather in anticipation of school being closed (and it is closed).